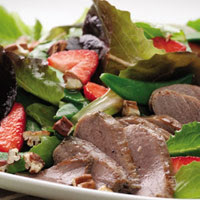 Strawberries provide a sweet counterpoint to rich duck breasts. Here, they meet in a quick salad for two, dressed with a rhubarb vinaigrette. Showcase the fruity, tangy dressing and the smoky grilled duck with the smoky, raspberry character of a Washington State Syrah. Bring rhubarb and water to a simmer in a small saucepan over medium-high heat. Cover, reduce heat to low, and simmer for 5 minutes. Uncover and continue simmering for 7 minutes more. Pour the rhubarb into a fine-mesh strainer set over a large bowl. Set aside to drain, collecting the rhubarb juice in the bowl. Preheat grill to medium or place a grill pan over medium heat. Season duck breasts with 1/4 teaspoon each salt and pepper. Oil the grill rack (see Tip) or coat the grill pan with cooking spray. Grill the duck, turning once, until an instant-read thermometer inserted into the thickest part registers 150 degrees F for medium, 4 to 8 minutes per side, depending on the thickness. Transfer to a clean cutting board and let rest for 5 minutes. Meanwhile, bring 1 inch of water to a boil in a small saucepan. Add sugar snaps; cook for 1 minute. Drain and rinse under cold water until room temperature. Discard the rhubarb solids in the strainer. Whisk oil, honey, vinegar and the remaining 1/4 teaspoon each salt and pepper into the rhubarb juice. Reserve 2 tablespoons of the dressing. Toss lettuce, strawberries and the sugar snaps with the dressing in the large bowl. Slice the duck; divide the salad between 2 plates and top with the sliced duck. Drizzle the salads with the reserved dressing and garnish with pecans. Ingredient Note: Boneless duck breasts range widely in weight, from about 1/2 to 1 pound, depending on the breed of duck. They can be found in most supermarkets in the poultry or specialty-meat sections or online at mapleleaffarms.com or dartagnan.com. After the skin is removed, an 8-ounce duck breast is just the right size for one serving. Tip: To toast chopped pecans: Place in a small dry skillet and cook over medium-low heat, stirring constantly, until fragrant and lightly browned, 2 to 4 minutes. Tip: To oil the grill rack: Oil a folded paper towel, hold it with tongs and rub it over the rack. (Do not use cooking spray on a hot grill.) When grilling delicate foods like tofu and fish, it is helpful to spray the food with cooking spray. MAKE AHEAD TIP: Cover and refrigerate the dressing (Steps 1 & 5) for up to 5 days. Calories 391, Total Fat 20 g, Saturated Fat 3 g, Monounsaturated Fat 8 g, Cholesterol 87 mg, Sodium 668 mg, Carbohydrate 26 g, Fiber 8 g, Protein 28 g, Potassium 1025 mg. Daily Values: Vitamin A 70%, Vitamin C 140%. Exchanges: Fruit 1, Vegetable 2, Lean Meat 3, Fat 3. This entry was posted on 2:34 AM and is filed under Duck and Goose . You can follow any responses to this entry through the RSS 2.0 feed. You can leave a response, or trackback from your own site.